A truly emotional – and wonderful – occasion. 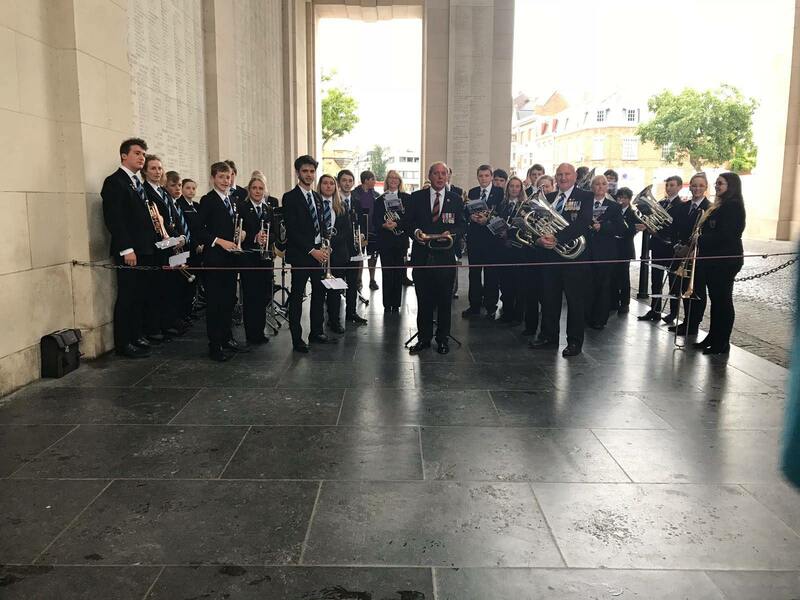 Camborne Youth Band played at the Menin Gate, Ypres, Belgium, tonight to an audience of hundreds. Ambassadors for Cornwall’s youth and for Brass Bands everywhere. We remembered the millions who died in World War One. The Band was following in the footsteps of Cornish miners from Dolcoath who signed up in 1914 and joined the Royal Army Medical Corps under local doctor William Blackwood. On Saturday 25 August (the day before the Menin Gate), they visited Estaires, where the men were stationed and famously played three rugby games in spring 1915. Corey Willliams, the great great grandson of one of these men, is in the Band and was carrying his bugle. The Band presented town officials with a rugby ball signed by current Devon and Cornwall teams and laid wreaths by the war memorial, after playing the Last Post on the historic bugle. They then played a concert in the local park. Estaires communications wizard Tony Haverland made these two videos which caught a flavour of the day at Estaires. This was part of our project PLAYING FOR CAMBORNE, funded by the Heritage Lottery Fund. There’ll be an exhibition about it all at Heartlands, Pool, opening on 11 October 2018. Here’s a video of the Band presenting the rugby ball, then playing by the war memorial. And here playing in the local park.